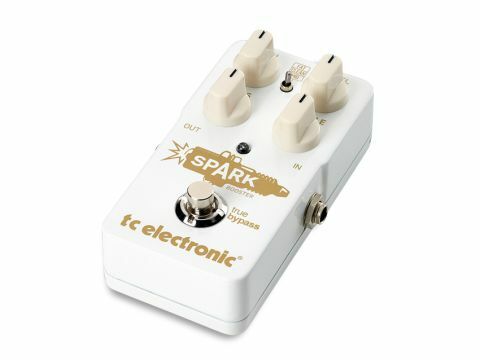 Whether you've picked up any of TC's other drive pedals or not, you'll be in fine company with the Spark Booster. Simply excellent tonal character and versatility. Like all pedal makers worth their salt, TC Electronic tries to cover all the bases. We witnessed this last year with the MojoMojo Overdrive, Dark Matter Distortion and the Röttweiler Distortion - three distinctive overdrives that each held their own, and also worked together as a team. A trilogy, if you will. Unfortunately, the best trilogies tend to go off the rails once you introduce a fourth instalment, so we're concerned the Spark Booster could be 'the Dull-tone Menace' that spoils the fun. Fear not, young Padawan. TC has advanced its series with the only addition that makes sense - a booster pedal brimming with versatility. The Spark Booster works as both a coloured and a clean boost, with the level knob alone offering up to 26dB of clean boost. The gain knob controls the character of the boost between clean and pushed, and when it gets up really high, it starts to add a soulful character similar to TC's MojoMojo drive. Bass and treble fine-tune the frequencies, and the toggle switch in the middle can be set to Clean, Fat or Mid to boost different bands of frequencies. Playing with each control is very intuitive and really does give extra life and flavour to your tone.